, the greatest astronomer perhaps that any age has produced, was born at Wiel in the dutchy of Wirtemberg, Dec. 27, 1571. 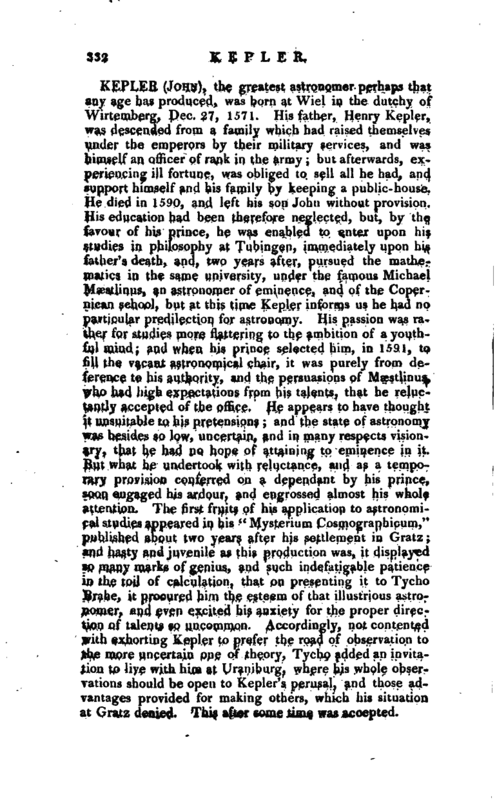 His father, Henry Kepler, was descended from a family which had raised themselves under the emperors by their military services, and was himself an officer of rank in the army; but afterwards, experiencing ill fortune, was obliged to sell all he had, and support himself and his family by keeping a public-house. He died in 1590, and' left his son John without provision. His education had be^n therefore neglected, but, by the favour of his prince, he was enabled to enter upon hi* studies in philosophy at Tubingen, immediately upon his father’s death, and, two years after, pursued the mathematics in the same university, under the famous Michael Maestlinus, an astronomer of eminence, and of the Copernican school, but at this time Kepler informs us he had. no particular predilection for astronomy. His passion was rather for studies more fluttering to the ambition of a youthful mind; and when his prince selected him, in 1591, to fill the vacant astronomical chair, it was purely from deference to his authority, and the persuasions of Masstlinu^ who had high expectations from his talents, that he reluctantly accepted of the office. He appears to have thought it unsuitable to his pretensions; and the state of astronomy was besides so low, uncertain, and in many respects visionary, that he had no hope of attaining to eminence in it. 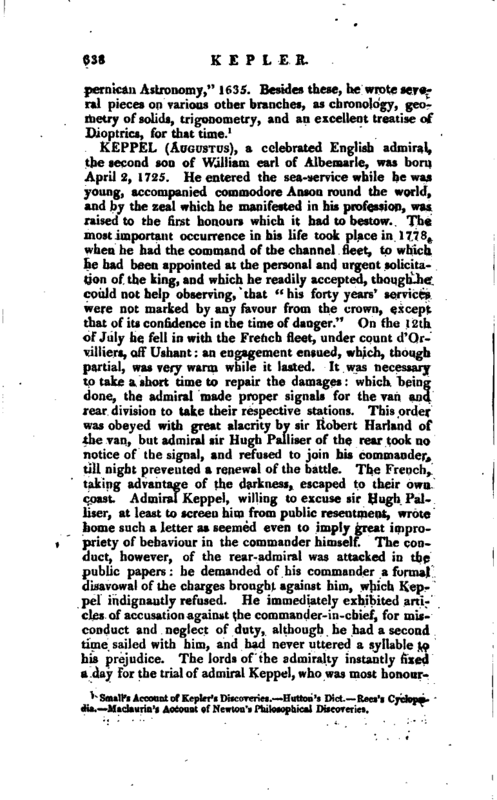 But what he undertook with reluctance, and as a temporary provision conferred on a dependant by his prince, soon engaged his ardour, and engrossed almost his whole attention. The first fruit? of his application to astronomical studies appeared in his “Mysterium Cosmographicum,” published about two years after his settlement in Gratz; and hasty and juvenile as this production was, it displayed so many marks of genius, and such indefatigable patience in the toil of calculation, that on presenting it to Tycho Brahe, it procured him the esteem of that illustrious astronomer, and even excited his anxiety for the proper direction of talents go uncommon. Accordingly, not contented with exhorting Kepler to prefer the road of observation to the more uncertain one of theory, Tycho added an invitation to live with him at Uraniburg, where his whole observations should be open to Kepler’s perusal, and those advantages provided for making others, which his situation at Gratz denied. This after some time was accepted. | In 1597, Kepler entered into the married state, which at first created him great uneasiness, from a dispute which arose about his wife’s fortune; and, the year after, he was banished from Gratz on account of his religion, but afterwards recalled, and restored to his former dignity. However, the growing troubles and confusions of that place inclined him to think of a residence elsewhere; and he now determined to accept T. Brahe’s invitation, and accordingly left the university of Gratz, and removed into Bohemia with his family in 1600. In his journey he was seized with a quartan ague, which continued seven or eight months; and prevented his profiting by Tycho’s kindness, and, what was worse, some petty differences interrupted their connection. 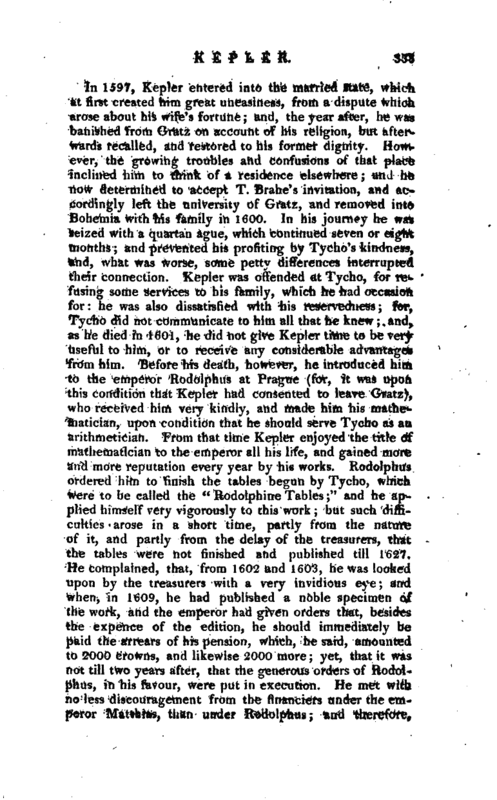 Kepler was offended at Tycho, for refusing some services to his family, which he had occasion for: he was also dissatisfied with his reserved ness; for, Tycho did not communicate to him all that he knew; and, as he died in 1601, he did not give Kepler time to be very useful to him, or to receive any considerable advantages from him. Before his death, however, he introduced him to the emperor Rodolphus at Prague (for, it was upon this condition that Kepler had consented to leave Gratz), who received him very kindly, and made him his mathematician, upon condition that he should serve Tycho as an arithmetician. From that time Kepler enjoyed the title of mathematician to the emperor all his life, and gained more and more reputation every year by his works. Rodolphus ordered him to finish the tables begun by Tycho, which were to be called the “Rodolphine Tables” and he applied himself very vigorously to this work but such difficulties arose in a short time, partly from the nature of it, and partly from the delay of the treasurers, that the tables were not finished and published till 1627. He complained, that, from 1602 and 1603, he. was looked upon by the treasurers with a very invidious eye; and when, in 1609, he had published a noble specimen o/ the work, and the emperor had given orders that, besides the expence of the edition, he should immediately be paid the arrears of his pension, which, he said, amounted to 2000 crowns, and likewise 2000 more; yet, that it was not till two years after, that the generous orders of Rodolphus, in his favour, were put in execution. He met with no less discouragement from the financiers under the emperoc Matthias, than under Rodolphus; and therefore, | after struggling with poverty for ten years at Prague, began to think of quitting his quarters again. He was then fixed at Lints by the emperor Matthias, who appointed him a salary from the states of Upper Austria, which was paid for sixteen years. In 1613 he went to the assembly at Ratisbon, to assist in the reformation of the calendar; but returned to Lints, where he continued to 1626. In November of that year, he went to Ulm, in order to publish the “Rodolphine Tables;” and afterwards, in 1629, with the emperor’s leave, settled at Sagan in Silesia, where he published the second part of his “Ephemerides;” fot the first had been published at Lints in 1617. In 1630, he went to Ratisbon, to solicit the payment of the arrears of his pension; but, being seized with a fever, which, it is said, was brought upon him by too hard riding, he died there in November, in his 59th year. To this sagacious philosopher we owe the first discovery of the great laws of the planetary motions, viz. that the planets describe areas that are always proportional to the times; that they move in elliptical orbits, having the sun. in one focus and that the squares of their periodic times, are proportional to the cubes of their mean distances which are now generally known by the name of Kepler’s Laws. Kepler had a particular passion for finding analogies and harmonies in nature, after the manner of the Pythagoreans and Platonists; and to this disposition we owe such valuable discoveries, as are more than sufficient to excuse his conceits. Three things, he tells us, he anxiously sought to find out the reason of, from his early youth viz. Why the planets were six in number? Why the dimensions of their orbits were such as Copernicus had described from observations? And what was the analogy or law of their revolutions? He sought for the reasons of the two first of these, in the properties of numbers and plane figures, without success. But at length reflecting, that while the plane regular figures may be infinite in number, the regular solids are only five, as Euclid had long ago demonstrated: he imagined, that certain mysteries in nature might correspond with this remarkable limitation inherent in the essences of things; and the rather, as he found that the Pythagoreans had made great use of those five regular solids in their philosophy. He therefore endeavoured to find some relation between the dimensions of these solids and the intervals of the planetary spheres > | thus, imagining that a cube, inscribed in the sphere of Saturn, would touch by its six planes the sphere of Jupiter; and that the other four regular solids in like manner fitted the intervals that are between the spheres of the other planets: he became persuaded that this was the true reason why the primary planets were precisely six in number, and that the author of the world had determined their distances from the sun, the centre of the system, from a regard to this analogy. Being thus possessed, as ha thought, of the grand secret of the Pythagoreans, and greatly pleased with his discovery, he published it, as we have already observed, under the title of “Mysterium Cosmographicum;” and was for some time so charmed with it, that he said he would not give up the honour of having invented what was contained in that book, for the electorate of Saxony. Tycho Brahe, however, gave him advice on the subject, which altered his opinion, and to which we are indebted for the more solid discoveries of Kepler. This great man, soon after the death of Tycho, found that astronomers had erred from the first rise of the science, in ascribing always circular orbits and uniform motions to the planets and he discovered that each of them moves in an ellipsis, which has one of its foci in the centre of the sun that the motion of each is really unequable, and varies in such a manner, that “a ray supposed to be always drawn from the planet to the sun describes equal areas in equal times.” It was some years later before he discovered the analogy that there is between the distances of the several planets from the sun, and the periods in which they complete their revolutions. 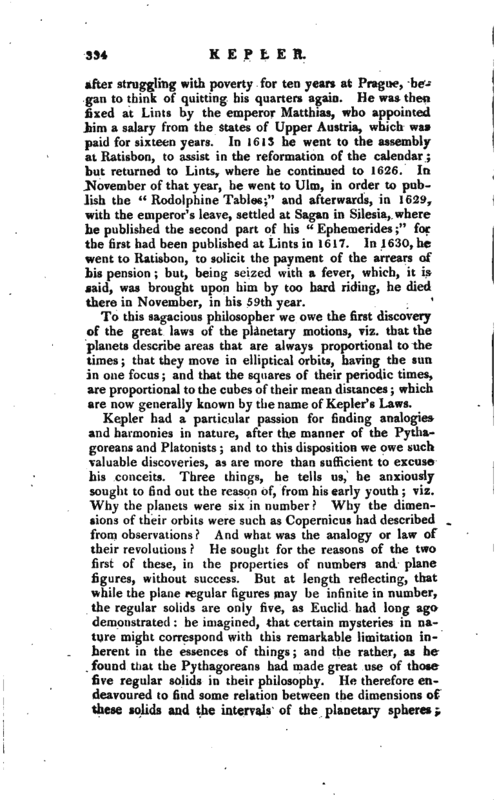 He has, however, left it upon record, that on the 15th of May, 1618, he found that “the squares of the periodic times are always in the same proportion as the cubes of the mean distances from the sun.” When Kepler saw, according to better observations, that his disposition of the five regular solids among the planetary spheres was not agreeable to the intervals between their orbits, he endeavoured to discover other schemes of harmony. For this purpose, he compared the motions of the same planet at its greatest and least distances, and of the different planets in their different orbits, as they would appear viewed from the sun; and here he fancied that he had found a similitude to the divisions of the octave in music. Of these notions, which are wholly unfounded in nature, he was so fond, that hearing of the discovery of the four | satellites of Jupiter by Galileo, he owns that his first reflections were from a concern how he could save his favourite scheme, which was threatened by this addition to the number of the planets. The same attachment led him into a wrong judgment concerning the sphere of the fixed stars: for being obliged, by his doctrine, to allow a vast superiority to the sun in the universe, he restrains the fixed stars within very narrow limits; nor did he consider them as suns placed in the centres of their several systems, having planets revolving round them. 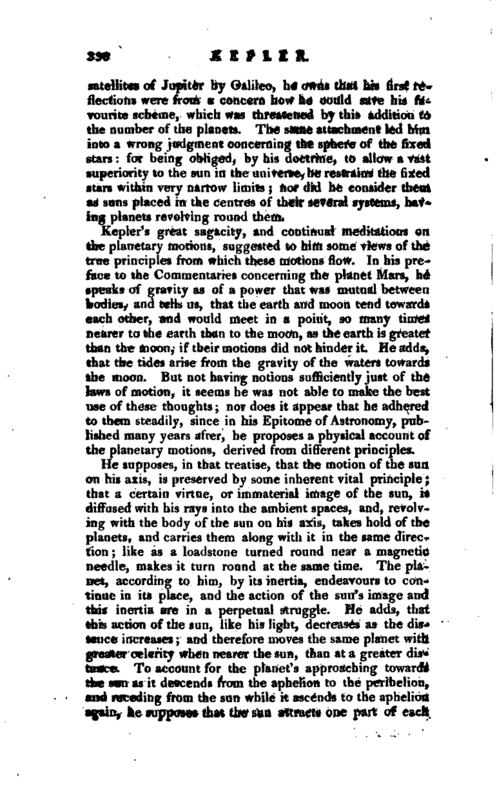 Kepler’s great sagacity, and continual meditations en the planetary motions, suggested to him some views of the true principles from which these motions flow. In his preface to the Commentaries concerning the planet Mars, he speaks of gravity as of a power that was mutual between bodies, and tells us, that the earth and moon tend towards each other, and would meet in a point, so many times nearer to the earth than to the moon, as the earth is greater than the moon, if their motions did nqt hinder it. He adds, that the tides arise from the gravity of the waters towards the moon. But not having notions sufficiently just of the laws of motion, it seems he was not able to make the best use of these thoughts; nor does it appear that he adhered to thorn steadily, since in his Epitome of Astronomy, published many years after, he* proposes a physical account of the planetary motions, derived, from different principles. He supposes, in that treatise, that the motion of the sun on his axis, is preserved by some inherent vital principle; that a certain virtue, or immaterial image of the sun, ifc diffused with his rays into the ambient spaces, and, revolving with the body of the sun on his axis, takes hold of the planets, and carries them along with it in the same direction; like as a loadstone turned round near a magnetic needle, makes it turn round at the same time. The planet, according to him, by its inertia, endeavours to continue in its place, and the action of the sun’s image and this inertia are in a perpetual struggle. He adds, that this actionof the sun, like his light, decreases as the distance increases and therefore moves the same planet with greater celerity when nearer the sun, than at a greater dis tance. To account for the planet’s approaching toward the sun as it descends from the aphelion to the perihelion, and receding from the sun while it ascends to the aphelion again, he supposes that the sun attracts one part of each | planet, and repels the opposite part; and that the part attracted is turned towards the sun in the descent, and the other towards the sun in the ascent. By suppositions of this kind, he endeavoured to account for all the other varieties of the celestial motions. 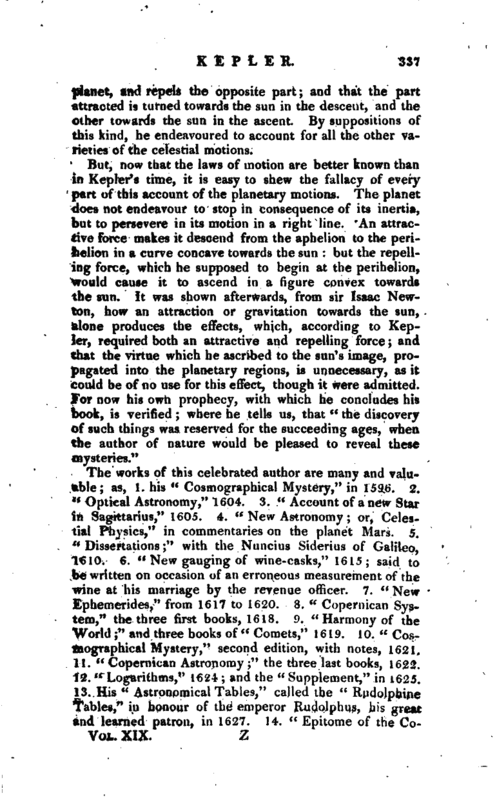 Small’s Account of Kepler’s Discoveries.—Hutton’s Dict. 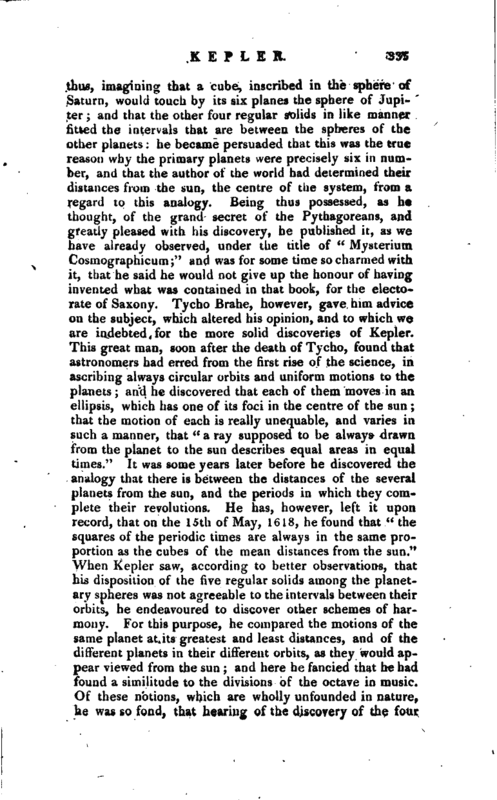 Rees’s Cyclopædia.—Maclaurin’s Account of Newton’s Philosophical Discoveries.